March 6, 2019 - The University of Houston Law Center is ranked No. 29 in Law.com's 2019 Go-To Law School list. The Law Center propelled 14 spots from its No. 43 ranking in 2018. Law.com reported that 16.37 percent of the Law Center's 2018 graduating class secured associate jobs in “Big Law” – the top 100 law firms that are considered to be among the largest and most prestigious in the country. 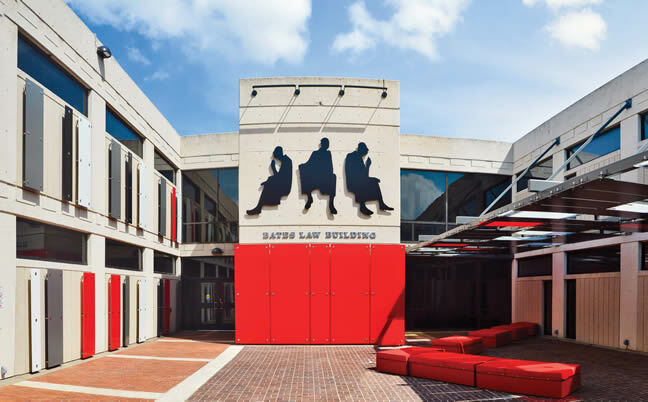 "I am delighted that the University of Houston Law Center has had one of the biggest jumps on the Go-to Law Schools rankings for students who are placed at associate jobs at the biggest law firms," Dean Leonard M. Baynes said. "Many thanks to Assistant Dean Tiffany Tucker for her leadership of the Career Development Office and the dedication and commitment of all members of her team. "I am also thankful for Provost Short and the senior management of the University for their dedication and support of the Law Center." “We are thrilled to see this significant increase in hiring of Law Center students and graduates at the nation’s top law firms,” added Tiffany J. Tucker, Assistant Dean of Career Development. “Top firms are becoming more aware of the superior quality of our legal program due to Dean Baynes’ tireless support and outreach to the legal community, the incredible success of our mandatory professional development training and career development programing, and the proactive and continuous employer relationship building led by our Director of Employer Relations and Development, Kourtney James. The Law Center is located in Houston, one of the nation’s top legal markets. The city is also home to the world’s largest health care and medical complex and recognized as the energy capital of the world with headquarters of multiple Fortune 500 companies headquartered here. The Law Center's Health Law, Intellectual Property Law, and Part-time programs rank in the U.S. News Top 10. Distinguished by its relatively modest tuition, the Law Center has been cited as one of the “best values” in legal education today.